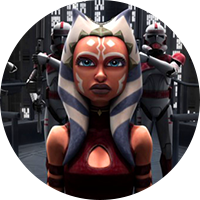 Sorry, but I can’t stand Ahsoka, and never understood her appeal (beyond the perverted ones). She started out as a generic spunky obnoxious (un-Jedi like) sidekick, and turned into a boring miss know it all by the end as Filoni’s pet character. Her inclusion in Rebels amounted to little more then fanservice. I am utterly bored stiff with her now.